It all started after Jeremy’s accident. I always believed in God, but I didn’t truly understand how present He really is until I was so mad that I screamed every cuss word I could remember in the English language at Him. Why did my husband suffer so horribly from suicidal thoughts? Was Jeremy here now fighting for his life because he had almost succeeded at ending it? Is that what happened? Is that what God wanted? I didn’t understand any of it. Nothing. So I did it. I yelled at Him. I screamed at the top of my lungs and asked Him why us. I told God to **** off. I told Him I hated Him, that Jeremy didn’t deserve this. MY husband…a man who always puts others first…a man who loves me and his boys so wholly that his depression diagnosis made no sense to me at the time. This was about me and my family. And I let God have it. 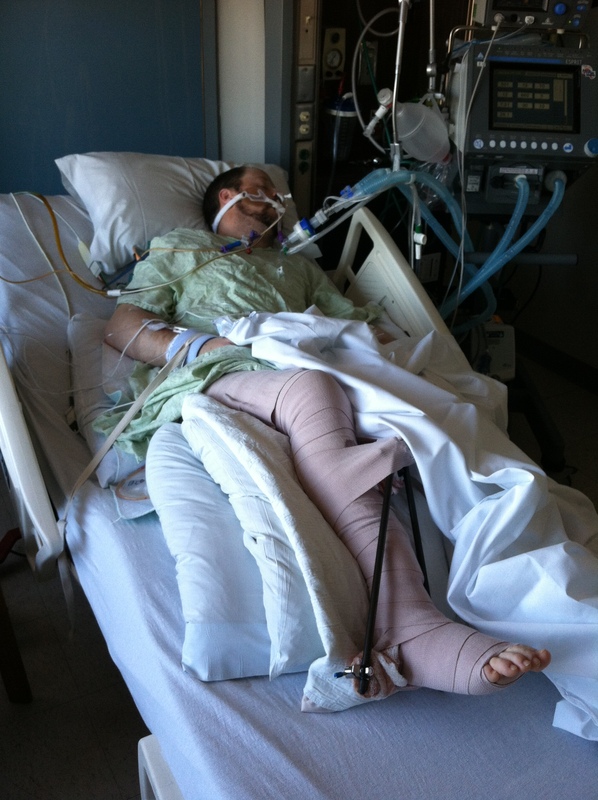 Jeremy in ICU, February 2012. After I got my wits about me and believed God had likely had enough, I pulled my shell of a self off the floor. While it had seemed like only God and I were having it out in that waiting room while Jeremy was in a life-saving surgery, the reality was that over 20 people had just witnessed my breakdown. I looked up and saw Him. Yes. Him. I saw Jesus crying. I’ll never forget it. My sister-in-law, just 19 years old at the time, had tears streaming down her face having witnessed what I had just done. But instead of lashing out in anger at me, God chose instead to reveal His presence to me in a way I could no longer ignore. I saw my Savior in Jacqui. He was there and I couldn’t deny His plan any longer. In that moment, I knew Jeremy was going to live. I was still terrified, but a comfort I had never understood before began to overtake my fear. And 20 minutes after that breakdown happened, a surgeon approached me with news that Jeremy’s internal injuries were healing. Jeremy was, in fact, a miracle. Twenty years ago, without modern life-saving technology and the incredible surgeons who allow God to save others through their hands, my husband would not be here. 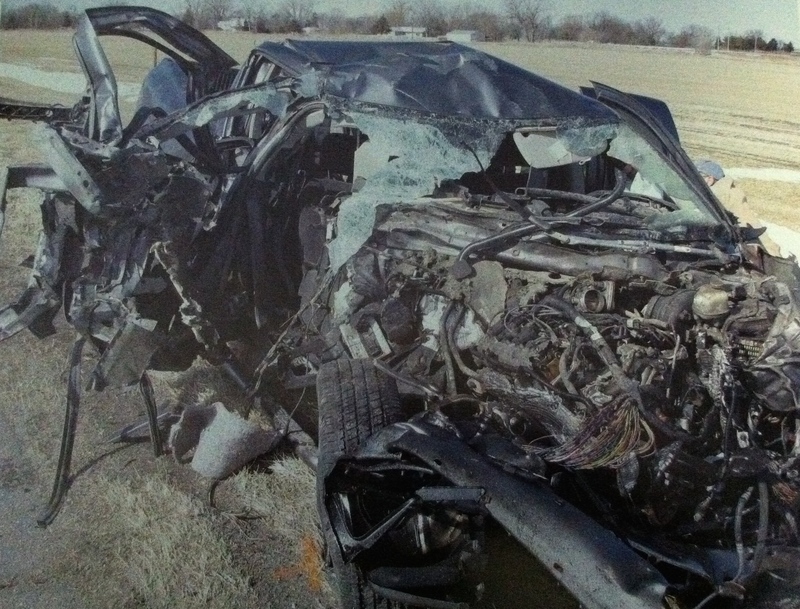 There was still a rough road ahead, but Jeremy was healing. It was the first good news I had heard in a long while…and it came directly after I told God to screw Himself. After that, everything changed. My faith exploded. God had revealed Himself so strongly to me that I knew something was going to come from this…something good. God is only good and I knew He had a plan I knew nothing about. I didn’t have to know at the time…I just had to learn to trust. Key word…learn. It wasn’t easy. But now I get it. Three years later, Jeremy and I are published Christian co-authors. We found healing and faith during our journey with depression. We learned that God wanted us to fight together in order to help others suffering understand they are never alone. You are never alone. Jeremy designed the cover of our book himself as this was such a personal endeavor. 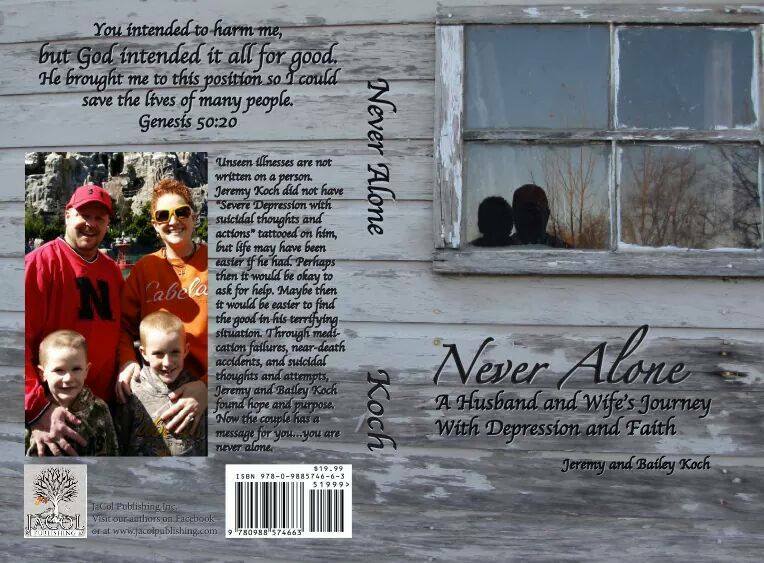 “Never Alone: A Husband and Wife’s Journey with Depression and Faith” is now available in both eBook and paperback. A labor of love, Jeremy and I are sharing our reality with the world because so many suffer in silence. The book is only one way that we can share with the world the truth about God’s presence during terrifying or devastating situations. But we all need reminders sometimes. I knew God was there. He was sitting right beside me in that passenger seat. And this is where haters will hate. And feel free. But you know what, He’s with you too. You can say music is just music, that it’s only there so the artist can make a buck. But what if God wanted that song to be written for me? Can you prove He didn’t? As a Christian co-author now, I can tell you that writing that book came about because Jeremy and I knew it is what God wanted from us. We know we are meant to help others. It is possible that somebody, somewhere, will pick up our book and choose to put the gun down. THAT is why we wrote it. YOU are why we wrote it. and every single moment between. You were there. You were always there. It was You and I.
You’ve been walking with me all this time. 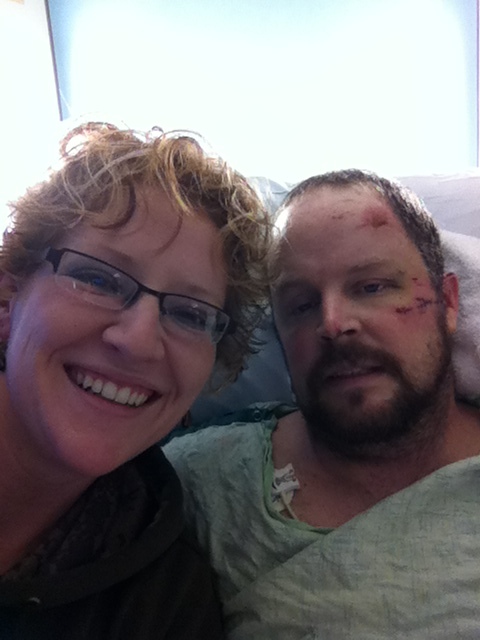 Jeremy, in February 2012, just after they extubated him and woke him from the medically induced coma. Thank you, Britt Nicole and My Bridge Radio. I am one of the reasons you were supposed to record and play “All This Time”. To this day, music is still my reminder of His company. Reading our book and remembering where we were then versus where we are now is always encouraging. But we all slip sometimes. Being a human requires pain, lessons we don’t want, and acceptance of realities we aren’t ready for. So the choice is ours. Do we choose to see God’s good in our lives or do we choose to continue to ignore Him? For me, seeing Him is as simple as hearing the music He places in my life just at the right times. I find myself singing along before I realize it. Then I remind myself that God may be wanting me to hear something. I listen to the lyrics and before I know it, I’m crying tears of joy and sheer astonishment at how good He truly is…how He speaks to me so clearly to get through difficult days and situations. It’s all about allowing myself to see Him, to hear Him, and often to let Him use me to help others. I let myself see God through music. So if you are new to this Christian music scene but you believe in the power of seeing God’s good in your life through music, let me help. These are my favorite and most motivational Christian songs that have helped me through very dark times. This is when I always see God…no matter if I turned on the music myself or if it comes to me because He wanted me to hear it and I was ignoring Him. And all of these play as I write. Writing is how I know I can help others because God gave me this gift and I intend to use it for His good. So now you know my favorites. Here is your challenge…what’s your story? Share. Find the healing in being open about our realities. And the best part is…as you heal, you will see others healing because you started something. There’s nothing more thrilling than seeing others come to God, healing, and knowing you allowed God to use you to help others. We can help one another when we learn it’s not about us. So share this post and comment telling me the songs that should be added! Let’s start a viral post of positivity, healing, reality, and most importantly…FAITH!!! 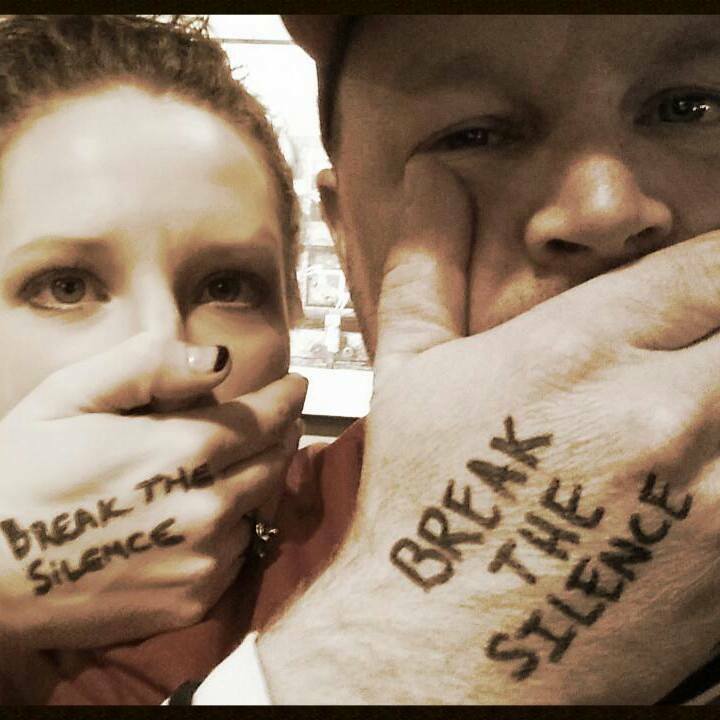 Why be silent? We all have a reality. Learn more about Jeremy’s and my story at www.jeremyandbailey.com. God bless you. I was going through a difficult time in my life and found myself unhealthy emotionally and physically. I had worn myself out completely trying to be everything I thought I needed to be; the best teacher, best mother, best wife, best house keeper. I was trying to fix every probaby that came my way and thought look at me I can do it all. After I had my 3rd child it was more than I could handle and was strugging to keep up with everything I was doing before to my same standards. I started to feel a little overwhelmed but I kept treading water trying to keep myself afloat This took all my effort everyday. I had not even time for a prayer. I lived in a state of exhaustion. I would still be trying to keep up this routine if my body hadn’t screamed stop at me and it could go no more. Little did I know, God was knocking on my door telling me He had a better life planned for me than that I was living. Meanwhile, I searched medically for what was robbing me of the life I had been living. I just wanted my life to be back to the way it use to be. I was very ill and was not functioning very well. This made me feel like a failure. I felt like I was failing as a teacher, a mother, a wife, and could accomplish nothing. I felt helpless. It took awhile to diagnos my medical issue which ended up being very curable. I had Microscopic colitis which can fall under the category of an autoimmune disease. While taking multiple tests to figure out what was going on in my body my fear grew and grew. Fear created anxiety, with the feelings of helplessness came depression. I was treating the colitis but I was not getting better. Everyday was a struggle to make it through. Every minute seemed like a life time. I was so relieved to have survived each day but in the morning I would wake in a panick to find myself in the same miserable state that I had endured the day before. I begged God to put and end to this terrible misery. I had myself convinced I was a terrible burden and my family would be better off without me. It was like being down in a deep deep well, trying to claw my way up out of it. It literally was my own Hell. I did seek God’s help because I had no where else to turn. At first I just begged God to give me back my life I once had. Then I begged that I just be put out of my misery. God finally got through to me this was not an issue I was going to “fix” all by myself. I grew up being a christian. I believed in God but I didn’t have a personal relationship with Him. I knew I needed him but didn’t know where to start. I can remember a day I grabbed my bible and kneeled down on the floor. I put my head on the Bible and weeped. It was a long journey of 3 years to be able to claim that I was doing well. Many people were placed in my life by God to help me on my journey to health emotionally and physically. My relationship grew with God. I now realized if He would have answered my first prayers then I would have never discovered the better life God had waiting for me. I would have not craved for a deeper more fulfilling relationship with God. Relationships take time to build. I once was told to think what a parent wants more than anything from their child; a relationship! Our Father who art in Heaven wants the same from us. He wants us to depend on Him. He wants to always to be there for us just like we want to be there for our children. While I was going through this experience I found it very hard to be thankful. We are to be thankful in all circumastance. I really struggled with this truth in the Bible. I knew I was not ready to be thankful for my struggles so I started looking for things I could be thankful for through out my day. I had to search some days but I started to cherish good moments. I began to be thankful for every littlle thing that I once took for granted. This was the beginning of me trying to retrain my brain. I had always thought of myself before as a very positive person and I probably came across that way to others too. However, I realized how often I put myself down in a day. I had terrible thoughts that ran through my head that would leave me feeling like I was such a dissappointment. Christian music helped me stop these mantra of thoughts. I bought a CD of Casting Crowns, and other CD’s that had some of the top Christian songs of the year. I found that the music could turn my thoughts in a more positive direction. When I didn’t have the music at my fingertips and negative thoughts would creep in my head, I would start humming or singing some of my favorite Hymns. If I could think of nothing else I would repeat over and over in my head simple but powerful words Jesus loves me… Jesus loves me. Today I have a deeper relationship with God and after a lot of help from other’s that God placed in my life including family, friends, bible study buddies, medical phycisians, homeopathic doctors, chiropractic help and I’m sure many others that prayed for me, I can say God had a better dream for me than I had for myself. I now ask for His help everyday. My fears are calmed. I know my trials are not over but I also know now I am not on my own. I also have come to the point in my life that I can give thanks for my struggles that I have went through. I do not take health for granted and thank Him everyday for my daily blessings. Do I still fall and find myself reverting back to my old ways of trying to do too much, trying to do things own my own before asking for help, of course! However, it doesn’t take me years to recover. My life experiences that God has lead me through have prepared me for today, tomorrow, and the future. I am armed with God’s grace and truth. That is all a person needs. My journey to Christ happened only a few years ago, I have always believed ,but until that mid November day I didn’t have Faith. I lived an ordinary life 3 great boys a housbond that loves me from the outside the Tilson family seemed just that ordinary, but thier mama had checked out. I spent the better half of a year being self serving if I wanted to go out I went out if I wanted to sleep in and not take care of my family I did after all the hubby would take care of the house the kids all of it, and I let him hold our family together all on his own. Our relationship was a mess mostly from my doing, and I didn’t care. On my way home from work that mid November day as I was approaching exit 222 I thought I can’t do this anymore I could pass right by this exit and leave this ordinary life. In a panic I spoke out to the Lord ” what will people think of me I’m 35 years old and I don’t know you the way I should.” That moment I thought of my place of employment the place I went to escape my ordinary life a place that Christ was not only accepted but embrassed by my co-workers my bosses those smiling faces that I seen every day for 40 hours a week they loved the Lord and that day I surrendered my heart to the Lord I know that our Lord God brought me to Skyview for that very reason he saved me that day and that is extraordinary. And I like your Christian song list. Some of the songs I was unfamiliar with so, of course, I checked them out online. Thanks.